An important step you can take to avoid problems with your garage door is to simply take a moment to observe it in action. If it does not operate smoothly and has slowed down recently or if it has developed an unusual noise that you do not remember hearing before, there is definitely a problem. Unusual grinding or scraping sounds, a noisy opener, or even a door that becomes a little jerky while in action, should definitely give you reasons to worry. How Can I Tell I Need This Service? As we previously mentioned, if you hear any unusual noise even though your door is opening just fine, or if it's rattling, moving too slowly (or too quickly! ), its panels are rusty, or the insulation (weather strips) looks worn - it's time to give our team a call. In fact, there's no reason to wait until you notice a potential problem. If you are using your garage door on a daily basis and it's been a year since the last inspection, this might be a good time to have our technicians make sure everything's in check. The first thing our technicians perform is a complete examination of every part of your system. That will let us know if any on the spot repairs or replacements are necessary. Once we've established the condition of your door system, we'll proceed with our standard routine. We'll lubricate your springs and rollers, adjust the cables as necessary, clear the tracks from blockages, and perform all sorts of safety tests to make sure the system isn't compromised in that regard. One of these tests involves making sure the safety sensors are properly aligned to detect obstacles. We'll make sure they are, and replace them on the spot if their lenses have become scratched. Aside from making sure your garage door system is safe to use, having it undergo routine maintenance will also prevent a lot of unnecessary damages. Worn components will be discovered and replaced on the spot, which will keep many accidents from occurring. That will ensure your system's longevity is increased, and will save you money on future repairs. 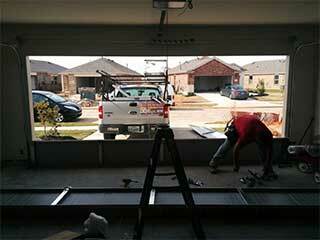 Our experts at Garage Door Repair Snellville are highly skilled and can take care of every type of related problem. Call us to schedule a maintenance appointment.